It must have been cold, Michigan’s early December, 1987. Viola Waters Bedwell’s youngest, her daughter Sue, had driven her to Westland Mall to buy some small gifts for employees and co-workers at Garden City Hospital, where she was, after more than two decades of loyal work, Executive Housekeeper. Just out of the car, Viola stopped a moment, then crouched to pick up a plain, white envelope. “Susie,” she said in a direct voice, “Get back in the car.” Once in the softer, hushed air of the front seats, with the doors locked, Viola held the envelope out to Sue: $1500 in cash. Viola was not comfortable. She began telling Sue they had to go to the police, turn the money in. She settled for mall security, but was told by a man with an incredible look on his face, with a smile of disbelief, that it wasn’t worth turning in cash. No one would expect it to be turned in, no one would come looking for cash. “Enjoy it,” he said. Viola’s first Christmas would have been in 1916, just six months after her July birth in Clarksville, Tennessee. Genealogically speaking, Viola first appears in the U.S. Federal Census records in 1920. The family was split up between two pages on the census that year. It was just Viola and Roy on the second page. Here is a photo of Viola when she was around five years old. There is a good chance she is standing on Commerce St.
That home at 604 Commerce no longer exists, but just two blocks from where it stood is the First Baptist Church, where Viola’s mother, Emma (the spelling used by her children and throughout the family, despite the various versions of her name on early official documents), was a member. One can imagine the family making the short walk for services, especially on Christmas, as Viola grew up. Perhaps it was here, watching a collection plate passed from hand to hand, that she began to consider the importance of money, fairness, and charity. As most of us do, Viola likely learned most of what she knew about work and money from her parents. So, a bit about them. Evidence suggests that Viola’s mother, Amandina Cook, came from a long line of farmers who settled as early as 1800 in or near Butler County, Kentucky. Amandina first appeared in the 1880 U.S. Federal census of that county, in the township of Burdens, Kentucky (aptly named, no doubt, given the challenges Viola was to face in her life). In the 1880 U.S. Census Amandina is listed as the youngest of five siblings, living with her parents, William and Abigail Cook. She was one year old at the time and the youngest of all her siblings, a characteristic she would share with her daughter, Viola. The next mention of Amandina is her inferred marriage to a Mr. McCormack, around 1895. If Amandina was 16 at the time of this marriage it wasn’t by much. She was a young mother. The details of Amandina’s life during this time are hazy. But, whoever Amandina married in 1895, he was dead before the 1900 census rolled around. 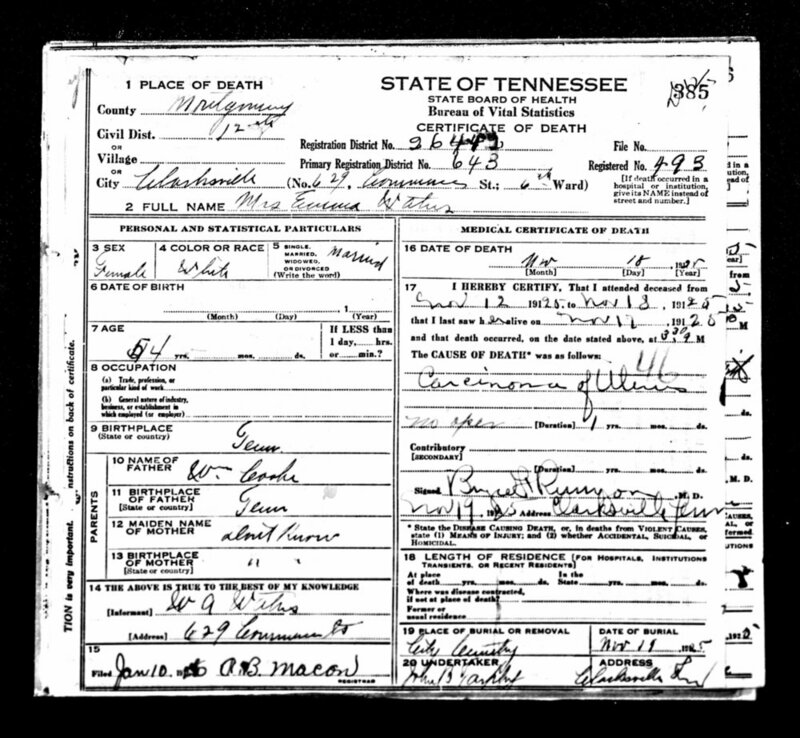 Amandina is listed on the 1900 U.S. Census (as “Amergine,” probably due to a transcription error) as living with her brother-in-law, Robi P. Kelly in Montgomery County, Tennessee. Robi’s wife was Angeline, almost certainly Amandina’s oldest sister. Robi and Angeline had four children of their own. Amandine “McCormack” is listed as the widowed sister-in-law. Her son, Franklin McCormack (3) is also listed as a “nephew-in-law”. In 1902, at about age 23, Amandina married her second husband and Viola’s father, William Albert Waters (1863-1935). And so, Viola’s first known family begins to take shape. In 1909 W. A. Waters transferred the deed of over 200 acres of land in Clarksville’s 6th District to Mrs. Amedine Waters for “love and affect,” a legal term often used when real estate is gifted to a family member without financial consideration. Will A Waters (49) - this age seems incorrect, though older than his wife it is unlikely that it was by 19 years. The fact that Romanna McCormac was not listed on the 1900 census, but is there in 1910, suggests that her father (the mystery McCormac) died while Amandina was pregnant with her. There are other more scandalous possibilities, but this seems to be the most likely one. In the early hours, about 3:30 am, on the morning of November 18, 1925 Viola’s mother died. It was a Wednesday. It was likely raining with slightly higher than normal temperatures for that time of year. She had been sick for about nine months, according the the newspaper announcement that afternoon and ultimately died of uterine cancer. Amandina was buried on Friday of that week, in the city cemetery. At the time of her death she was listed as living at 629 Commerce St., a few lots further West towards the Cumberland River that served as a Clarksville city boundary. Built in 1940, 15 years after Amandina's death, here is the house that currently stands at 629 Commerce St. It is hard to know for sure what house stood there in 1925, but it seems possible that it was of similar design and size. Certainly, as a girl of 9, the death of Viola’s mother began what must have been her own burdens. It seemed that her father, Will, was unable or unwilling to raise a daughter alone and he enlisted the help of what have been referred to throughout the family history as two “nice prostitutes.” Better to be raised by women, of whatever reputation, than by a man, the logic seemed to go. Nice as they might have been, there’s no way to overstate the shock Viola must have experienced at this time in her life, suddenly without either parent or the only home she knew. It seems that Viola lived at least a couple years like this before she was moved, presumably by the State of Tennessee, to the Convent of the Good Shepherd or the DeNeuville School for Girls in Memphis, TN. The 1930 census lists her as an “inmate,” and 12 years old. The school seemed to serve two different populations: girls who had been in some way orphaned or had little family support, and also girls who had run into trouble with the law or the state. One assumes here, given Viola’s calm personality and lifelong attachment to fairness, that it was certainly the former. But it would also be understandable, given her traumatic situation, that she acted out in ways that might have gotten someone’s official attention. While Viola was finding her way around the convent her widowed father and older brother, Roy, were living together. It was just the two of them in 1930 and they no longer seemed to be living at the Commerce address. The census simply lists them as living on “Alley.” Viola’s father was listed as a laborer in a tobacco factory. Roy, 13, was presumably a student. What few records exist about Viola’s time at the convent suggest that she entered in May of 1929. A year later, again in May, she was baptized, received her first communion, and was confirmed, all sacraments of the Roman Catholic faith that may have been required for her to stay there. In 1933, Viola was promoted to high school. What little we know about Viola's father during the time she was away comes from a letter that he struggled to write to his daughter Clydia, Viola's sister. Usually, it seems, he would have his son Wade write for him. Due to his failing eyesight, the handwriting is at times unclear, but what is not is that he was living a hard life. Clydia, about 21 at the time and living in Michigan, had been married to her husband John in 1930. I received your letter a few days ago. I was glad to hear from you. Lee has moved next to Wade so he saw your letter first. It’s a book and it got misplaced. You don’t know what a hard time I have had. Been thinking of getting a job somewhere to keep back some money so George can look in on me. He has had a falling out with the other family living in his house…How is John getting along? Give him my love. Things are awful blue here. I don’t know what will become of old dad. But don’t you worry about that. I will get by some way. I’m just having a hard life. Sorry. Thinking I don’t guess you would send this far, I am nervous. Wade has to work all the time so he doesn’t have time to write for me. Wade is just as good to me as he has ever been. She [Wade's wife Buelah] gives Wade the devil. Clydia don’t worry for four or five dollars…Clydia write to Judge Marshall and see what he says about Viola. Well you will have to look again, this letter, for I have not got good sight. Love you and John. from old dad, W.A.W [William A. Waters]. In April of 1934 Viola was released back to her father who was now living at 1027 Commerce St. in Clarksville. But less than a year after this reunion, William A. Waters, after a short illness, was dead. At 19, Viola had lived more than half of her life without her mother, spent several years in a convent, and now was fatherless as well. Despite this loss and the early fractures to the family, this photo of Viola with her brother George and sister Clydia suggests that the siblings again grew close as they began to pursue their own families. It is not clear how Viola met Mr. Lurton Bedwell, but on February 11, 1937 the two of them married. Viola was 20 years old at the time; Lurton, 27. Only a few weeks earlier, in January of 1937, waters of the Cumberland River swelled 20 feet above flood stage. It was the worst flooding recorded in Clarksville's history. People were homeless, water was tainted, and businesses were destroyed. Seven months after being married, the Bedwell's first child, Thomas Lurton “Jackie” Bedwell, was born. As an infant, at least once Jackie became serious ill. When Jackie was born this young family of three was living on “Madison extension.” By 1940 they had moved to “Paradise Road.” Four more children would arrive by the time 1946 rolled around: Peg (1940), May Dell (1943), John (1944), and Mary Sue (1946). One wonders what Viola’s earliest experience of motherhood was like, since she had no mother of her own after the age of 9. When at the convent she must have many “mothers” in the form of Catholic nuns. Little else is known about Viola, Lurton, and family through the newspapers and public records after 1937. 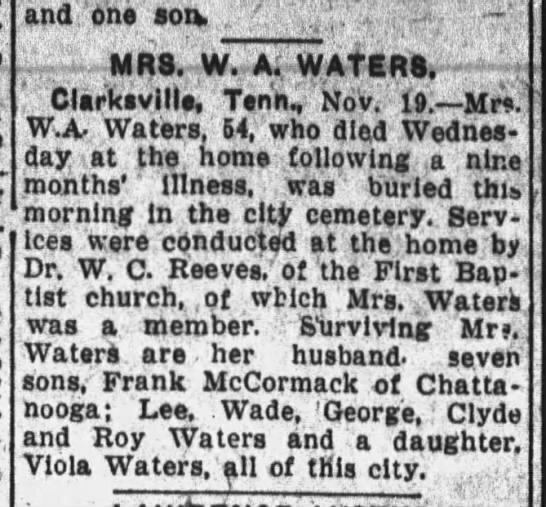 In addition to Jack’s, Mary Sue’s was the only other birth announcement to make it in the newspapers, and it reveals that the family had moved to Caldwell, Kentucky, about an hour and a half northwest of Clarksville. The only other mention of Viola during this time was a report of her being in a serious car accident. Although Viola was only “slightly injured,” two of the other passengers in the car suffered broken pelvises. The 1937 Ford that she was riding in was struck by a Boillin-Harrison truck. On the cloudy late spring evening of June 7th, 1951 Viola, Lurton, and their five children left Clarksville for Detroit. Jackie, the oldest, was 13 and Mary Sue, the youngest, was only 4. Lurton had been working in Detroit for some time and borrowed from a friend a car large enough to accommodate his family. He drove to Clarksville, loaded up his family and presumably some belongings, and they all headed north. As remembered by Mary Sue, they would often make that drive later to visit family. Sometimes they were 8-10 in the car. Though big cars, a couple of the youngest and smallest children inevitably had to sit on the floor. And Michigan did become home. Over the next 45 years, Viola would raise her five children in Dearborn Heights, survive the illness and loss of her husband Lurton in Westland, and live out her life in Garden City, where she would discover the power and pride of a dedicated career at Garden City Hospital. She would become the center of a family that would grow to include 22 grandchildren, 46 great-grandchildren, and 17 great-great grandchildren.